Refinishing becomes necessary when stains or other coatings break down or fail. 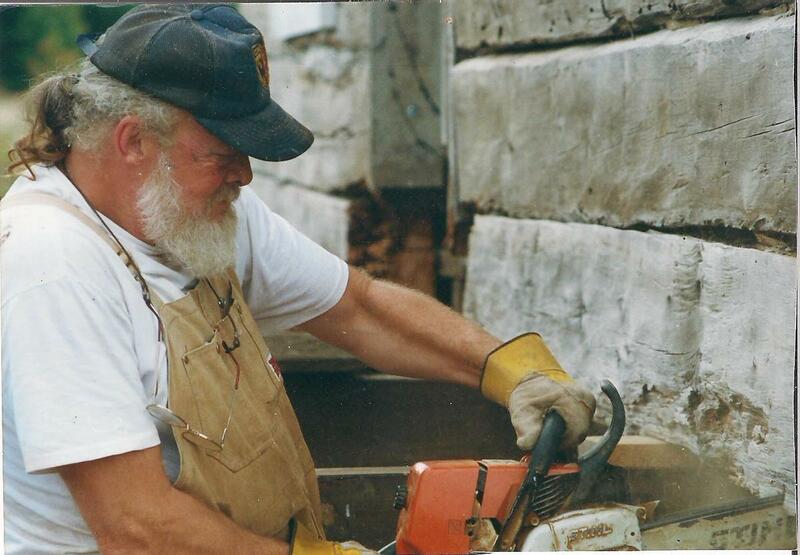 Before the application of a new stain, proper preparation of wood surfaces is a must. Media Blasting is one of the best methods although soda, glass, and sand have been used as well. Whatever medium is being used, it is reduced to fine grit, about the same hardness as the wood to be stripped. Corn cob is safe, non-toxic and biodegradable, it poses no environmental hazard. In fact, it is excellent garden mulch. “COB” transforms weathered and stained logs to a “new look”, ready to refinish. 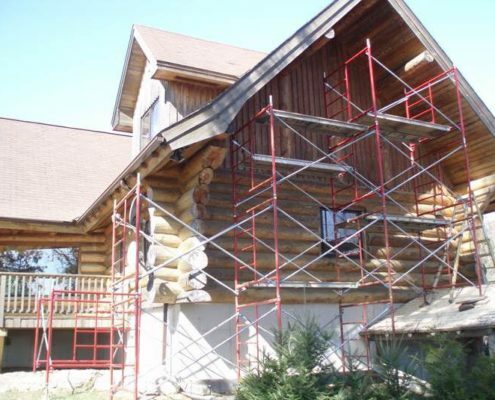 Every log home is unique and there are many choices to be considered when choosing a stain. Staining is done for a variety of reasons. Properly used, the stain can emphasize the wood grain and give a light wood character. It can make a new wood look old or a common wood looks like a rare one. Talk to your contractor about UV protection, breathable, waterborne and semi-transparent stains. Also, ask about the frequency in terms of staining. 5-7 years? Which brand does he prefer or recommend? Thanks to our associate who graciously provided these photos: he and his team are known for quality work and knowledge of Log and Wood Homes. 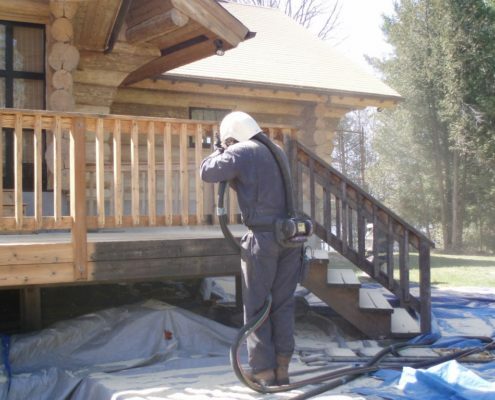 First in the process of restoration would be Media Blasting: Soda, glass media and corn-cob are the preferred media for cleaning and preparing to stain your wood or logs.